For the healthcare market, a key attribute for wire shelving and carts is the smoothness of the finish, to protect employees and supplies. In this area, LogiQuip stands above all others in a field of me-too product. We apply more nickel to our finish than our competition to reduce the chance for “orange peeling”, rough spots and flaking. LogiQuip offers a complete range of components and sizes to ensure your optimal storage success. Combined with our other open-storage lines, Par Stor and Par Wall, we have proven we can increase storage capacity given the same space or generate the same capacity in a smaller area..
LogiQuip’s Wire Shelving is made from high quality material. It is designed for the healthcare setting. 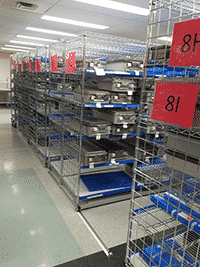 LogiQuip offers a variety of wire shelving, most notably our TSUN and LogiFlex products. TSUN is designed specifically for wrapped instruments and sterile packs. LogiFlex is great for two-bin or gravity-fed storage. LogiQuip Tubular carts are designed for heavy duty transportation of goods in the hospital setting. They make great exchange carts for IV Solutions, Linen, and Med Surg supplies. The Tubular Carts come with a heavy-duty dolly base and casters designed for transport. Our high density floor track systems are an efficient way to maximize your storage capacity in a smaller floor footprint. Shelving units glide easily over tracks creating active aisles to access needed product. Smooth, long lasting aluminum tracks are surface mounted, designed for easy and quick installation. Standard-duty skates, heavy-duty carriages and mechanical assist systems are available for all types of applications in Materials Management, Sterile Processing, Surgery and other departments with limited storage space. Available in a variety of configurations, our tracks are designed to be used with most of innovated storage offerings. Our four-sided track carriage frames create a strong foundation designed to hold and move heavier, multiple and back-to-back shelving units. Our overhead tracks provide clear aisle areas for easy cart movement and floor cleaning. A great application for areas with uneven floors.